43 year old Albion, Illinois resident, Ricky M. Michl Jr. passed away Friday, March 22, 2019 due to a motor vehicle accident in Saline County. Ricky was employed at Winkler Foods of Dale, Indiana. He loved to hunt and fish, but most of all he loved to cook his BBQ for competitions, friends, and family gatherings. 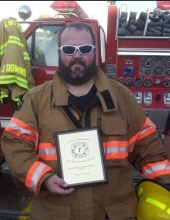 Ricky had been a volunteer firefighter and EMT in Albion. He had also worked in the meat department at Borowiak's IGA in Albion for many years. He is survived by his mother, Cindy of Olney. One son, Trenton James Michl of Albion, Illinois; a step-daughter, Jessica Martin of Evansville, Indiana and two step grandchildren, Maleki and Makiah Martin of Evansville, Indiana. Two uncles, Monty Long and his wife Mitzi and Steve Long and his wife Jolene of Albion, Illinois along with several cousins also survive. Ricky was preceded in death by his grandparents, Clyde and Erma Bunting and one uncle, Rickie E. Long. Funeral services for Ricky Michl Jr. will be 2:00 p.m. Thursday, March 28, 2019 at the First Baptist Church in Albion, Illinois with Brother Kirk Rowe officiating. There will be a visitation from 10:00 am until the time of the service at the church. Burial will follow in Pleasant Hill Cemetery northwest of Albion. Memorials may be made to the Albion Fire Department.